Everyone is more then welcome at our university on Saturday April 13th from 16:00 till 19:00. We will provide information about all our Bachelor and Master studies and about our new study programs on a Bachelor level. Furthermore there will be different workshops on how to write a good resume (CV), how to deal with losing your job, there will be different "uitzendbureau's" and SOAW with their job openings. There will be a pannel discussion with leaders of Curacao about the actual situation we are all facing, and much more. 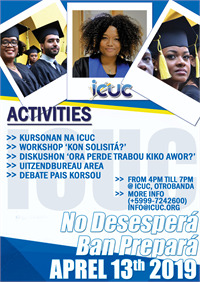 Come by ICUC on Saturday April 13th and experience our university for your self, "No desesperá, ban prepará"